Shearwater recently offered ShearWILD, an educational program centered around living with Florida’s native flora and fauna. This program was created by Shearwater’s Lifestyle Director based on residents’ interests and input. And it’s no wonder considering Shearwater’s more than 12 miles of trails and 600 acres of adjoining preserved natural habitat. Nature does more than provide pretty scenery at Shearwater. We know that spending time outside and getting some fresh air does wonders for your health, both physically and mentally. That is why Shearwater provides residents with abundant opportunities to get outdoors and live an active, healthy lifestyle. While any kind of exercise is good for your health, studies show that exercising outdoors can be more beneficial than exercising indoors. Running downhill, against the wind and across uneven terrain flexes different muscles and uses more energy than running on a flat treadmill. You also get your daily dose of Vitamin D, which can improve your disposition and commitment to a workout routine. 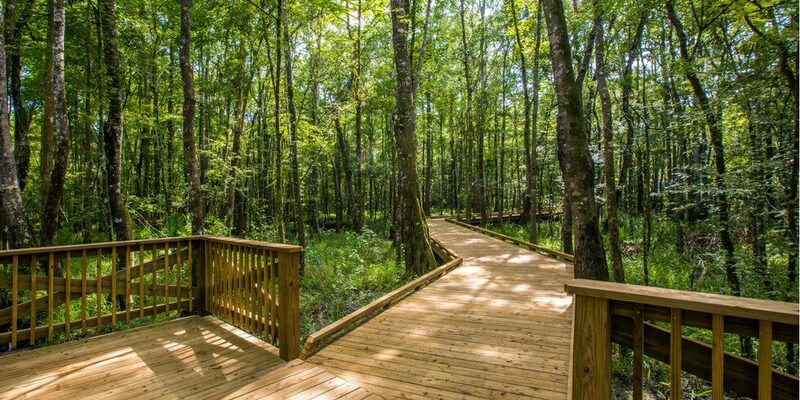 Shearwater’s 12 miles of paved, natural and boardwalk trails provide the perfect opportunity to move your daily run outdoors. Start your morning with a peaceful, solitary jog or join the Trailblazers running club to meet new people that share your interests and can help you stay accountable. Or, if running isn’t your speed, just a few miles down the road, you can kayak or canoe on Trout Creek to get some fresh air and strengthen your core. In future phases, Shearwater will even have its own kayak launch, so getting in some time on the water will be even easier. Simply sitting and enjoying the breeze has its own benefits, too. It’s been proven that time in nature reduces negative emotions like fear and anxiety, and boosts our feel-good endorphins. It can reduce depression and anxiety, increase our attention span and memory, and overall makes us more balanced and mentally healthy. Surrounding Shearwater are 600 acres of preserved habitat, scattered with ponds and wetlands. Multiple pocket parks and picnic areas provide spaces perfect for relaxing in the sun or having a meal al fresco with your neighbors. Just stroll down the trails to your favorite spot for a quiet break and mental rejuvenation. Time spent in nature connects us not only to the greater world, but to each other. People who spend time outside have stronger feelings of unity with their neighbors, and are more likely to help and support each other. These feelings help build a sense of belonging, creating a stronger community bond. Shearwater’s miles of trails serve multiple purposes. While they’re perfect for your morning jog, they also connect neighbors and residents together. Take your morning walk and stop at your neighbors to share a cup of coffee, walk down to the Yoga Lawn to take part in group exercise, or meet up in one of the parks to let the kids play while you have a chat. Shearwater was built for outdoor enthusiasts and nature lovers, and every aspect is designed to promote the health and wellness of its residents. To learn more about what makes Shearwater unique, join our Founders Club to receive news and updates.